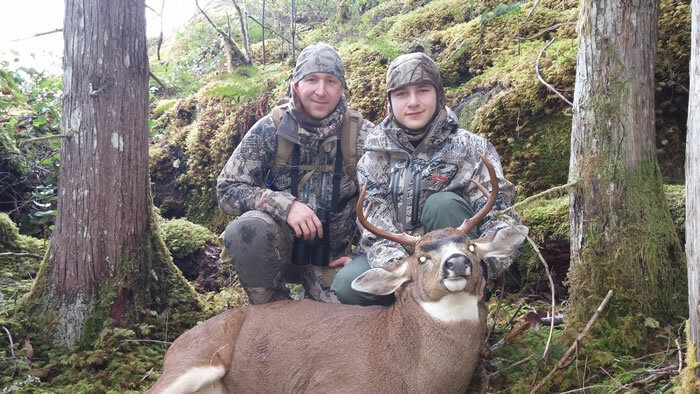 My oldest son just turned 13 a few months ago and with the start of deer season in close proximity he asked me if he could go deer hunting this year and possibly get his own buck. Great! We headed down to the Cabelas in Nanaimo and got a youth hunting license for him. September passed and not much hunting was done. As it got a little later into October we started to get more serious and started hunting on the days he was available (after school activities). Our first evening out we took the quad out from the house and parked it about 1/4 mile from our chosen spot and quietly snuck in. 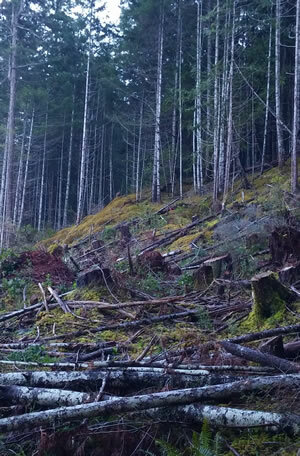 The spot we were hunting was a newer slash (last year) with a ton of debris left over from logging and very little new growth. This cut bordered along a small strip of mature timber that hid a creek and the deer were actively moving through it. After parking the quad and sneaking in we preceded to climb a small bank that gave us a small height advantage to glass the edges. We cleared the bank and glassed what we could see then continued sneaking on along the edge of the cut for 20 meters or so and my son said “Dad!” rather excitedly but still quietly, “Deer- Right There!” and he pointed to the far edge of the slash. Up went the binos and sure enough there was a doe, with a fawn in tow. Not even 2 minutes later out came a little spike buck, we had a good position and the buck offered an OK shot opportunity but after giving him the option my son decided to pass on this deer as he’d like something a little bigger and with a little more meat. After giving us several minutes of watching them the deer sauntered off back into the trees and as nightfall crept in we walked back to the quad and headed home. My son was pretty excited about his encounter with these deer! Fueled with that experience he (and his little brother) have been wanting to go out hunting any available time, so we continued to do so. A couple evenings ago we decided to go up the mountain a little more and check out an area I’d been watching some deer activity and we went for a hike. We hiked up and into the edge of the steep slash with the wind blowing down the mountain and into our face. It was apparent by the sign around that there were a few deer moving around. We continue hiking up the slash, finding a large rub, we continued on another 50 yards or so and we stopped to take a break. I could hear the excitement in my sons voice as he said “Dad! – Deer at 12’oclock!”, I quickly looked to see a doe coming out of the bush and out onto a mossy rock outcropping, I noticed a white flash in the trees that was too big to be a fawn. The doe kept looking back in that direction, so I told my son to “get ready! because I think she has a buck in tow”. We waited a few minutes and the doe couldn’t smell us and didn’t seem to mind us and she started to slowly walk down feeding towards us, this made the buck quite unhappy as he snorted and stomped his feet a few times, and the doe just ignored him. In a desperate attempt to get the doe back in line the buck came to the edge of the treeline about 75 yards away and only his face was exposed. I could see he was a good mature buck but couldn’t tell what he had for points. I slowly put a shell into the chamber of the .270 and asked my son if he wanted to take the buck. He didn’t have a good shot from where he was and the buck was cagey so I raised the rifle and was ready to shoot if he’d just expose himself a little more. This buck was Smart! He saw me raise the rifle and took a step to the side which put him behind a large stump, I matched his step in the opposite direction to try and angle on him for the neck shot but he again stepped to my left and behind the stump. 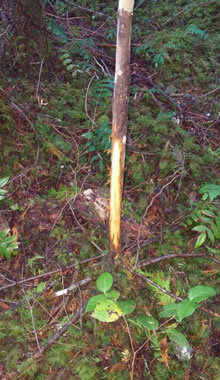 At this point I could see the edge of his face and the one antler, he was a decent 4 point on that side, so I was ready! We played peek-a-boo behind the stump for a minute or two and the buck didn’t even turn around he started backing up keeping the stump between us and he quickly spun and with a jump was out of my sight! 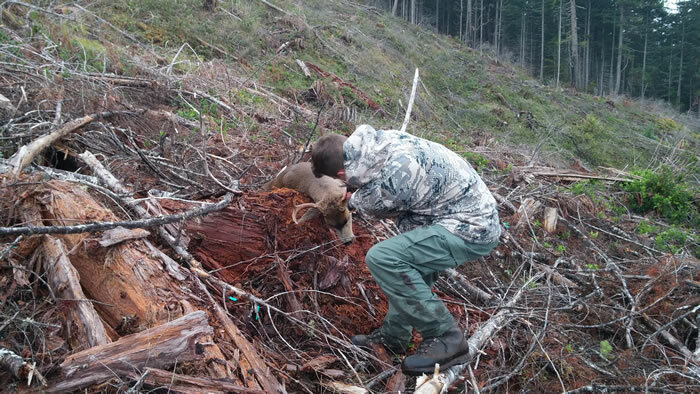 The doe followed right after… “Dammit!” I said in that state of hunting frustration to my son. This type of adrenaline pumping deer action while hiking on a mountainside in the timber appealed to my son and he was again pretty excited about the experience. There is a doe in this photo – she’s small but there! “Do you think he’ll come back dad?”, “Did we scare him away for good dad?”, “That was a big buck dad!” “Can we come back here tomorrow dad! ?” ha! I’d say he’s hooked. It was obvious this was a smart buck we’d just encountered and likely one of the mature bucks running around since he was also courting that doe. The deer were gone and darkness was falling so we started hiking out of the slash and headed back home on the quad, ready for another hunt. on another day. The next afternoon my son got home from school and we got our gear together and headed off to the same slash in the late afternoon with plans to hike up into the slash and just still hunt it from a good vantage point with the wind in our favour. We parked the bike and walked into the hill for a few hundred yards and we climbed up a small bank to get a good view of the slash, again my son spots another deer before me! “Dad – Deer on the far side!” “It’s a buck!” so I throw up the glasses and can see it’s a deer standing broadside facing up hill about 200 yards or so across the slash. I could see he was a decent 2 x 2 buck and would be a perfect first buck for my son. Getting closer wasn’t a possibility as the buck had us pegged and it was nothing but open slash between us with very little cover for us to move up. We had a good sized log right beside us so this was a good as place as any. As the buck lay when we found him. “Get Ready” I said to my Son as we jacked a shell into the chamber and got him into a comfortable position on the log. He’s had a fair bit of shooting experience with air rifles (he’s in cadets) so we talked a little about shot placement and where to hold the crosshairs and I told him to “take his time” as I held my binoculars on the deer. I could hear him taking a few deep breathes and the buck was being very generous with his time, my son did a 1,2,3 count and “BOOM” the buck jumped really good and took off like a rocket into the thick stuff as the shot echoed through the valley. It looked like a solid hit into the shoulder but I was a little unsure the way the buck took off. We immediately set off hiking up through the slash, taking our time to get up there. It took 10-15 minutes and we were standing in the position of the buck when my son shot. I could actually smell the buck at this point so I was getting pretty excited that he lay not too far but we hadn’t found him or the blood trail so I hadn’t said anything yet. We hiked in the general direction he took off and could see he left a big divot in the moss when he jumped over a small drop and as my eyes followed the path I thought he took, there he lay down at the bottom of the rocky outcrop, it was over! “Congrats on your first buck! and a fantastic shot” I told my son as I reached out and excitedly shook his hand. He was pretty stoked for his first buck! and so was I.
Dragging the buck out of the slash. We ended up with about 75lbs of de-boned meat for sausage and a couple roasts and tenders! 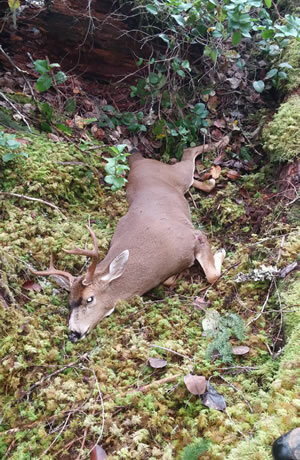 Hey Josh, Blacktails on the Island are a tough nut to crack. It really boils down to time in the field and a whole bunch of luck (created by time in the field). I try and stick to smaller areas that I can learn intimately. To find new spots you’ve gotta put some miles down, whether it’s tire tracks or boot leather just keep hunting the sign. Where the sign is usually where the deer are. I tend to look for old growth, lots of rocky outcroppings, nearby creeks, etc… But then again, these deer have 4 legs a heartbeat and a mind of their own.